If you read about soundproofing a room on the Internet, you may come across something called “isolation bars”. These are special attachments that will uncouple the plasterboard from the existing structure and framework in order to stop the sound vibrations travelling through the structure and into the adjoining property. 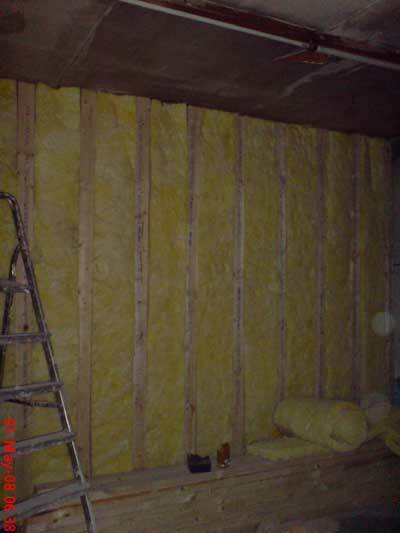 Originally I was going to use iso-bars on this party wall, but as I was also building a “Room within a room” that would be decoupled from the existing structure anyway, I decided that my money would be better put to use in three layers of plasterboard, instead of the two layers I had originally planned. This layer of insulation to the party wall is just my bit of added insurance and respect for my neighbours’ peace. I hope it helps! 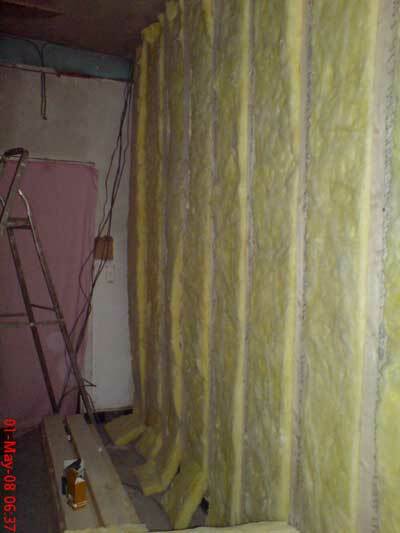 The 4″x2″ timbers are screwed directly to the wall at 18″ centres, and the rockwool is filling the cavities to a depth of 2″. Onto this structure will then go the three layers of plasterboard. You’ll notice in the top corner of the room, the budle of wires that the electrician has left.